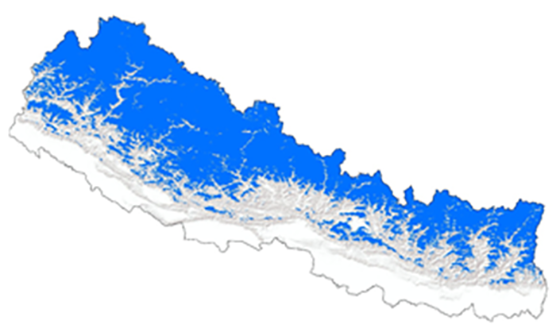 The snow cover area of Nepal was mapped using 8-day Level 3 global products generated using MODIS satellite data and made available by the National Snow and Ice Data Center (NSIDC). Several cloud filtering steps were applied based on a report published by ICIMOD in 2011. In 2012, the average annual snow cover area in Nepal was 21,680 km2, which is 15 per cent of the total area of Nepal. 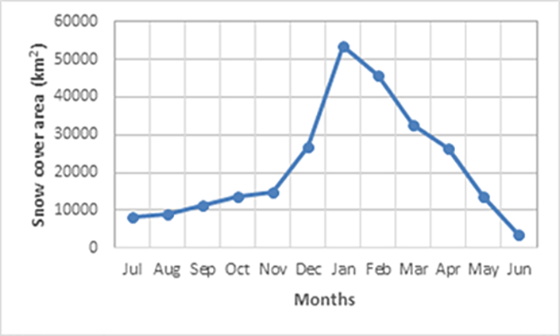 The months with the maximum and minimum snow cover in 2012 were January and June, which covered 36% and 2% of total area of Nepal, respectively. The figures below show variations of the average monthly snow cover area in 2012.